A few months ago, I took an online course that Karen was offering. Several years ago I fell in love with her photography before I really knew her name. But let me tell you this: her spirit is even more beautiful than her art. Through both her words and art, she shares such intimate parts of who she is that it’s hard not to be captivated by her. The online course offered guided exercises to help each participant delve deeper into their own lives and hearts and ideas. During the course, we were encouraged to pick a word for the year. I like things to start in January, so I picked my word back then and have slowly eased into it. Now that 2013 is fully here, I’ve really tried to fully embrace it. To capture this illumination, I am spending time reading and researching and learning about things I’ve been interested in but put on the back burner too long. I’m spending more time on mediation and digging deeper into my own beliefs and faith. We tell our children to “let your light shine”, meaning that we want them to be kind and let others see the love of God through them. That one is often easier to preach and teach than live, but I’m trying. Photography-related, I took the word both literally and figuratively. I’m really focusing on working on lighting in my photography. The key to great photography really is light and how you use it. Also, most people are quiet lovely and don’t even know it. Sometimes it takes seeing yourself through someone else’s eyes to see how beautiful you are. A master photographer knows the mechanics of how to get the shot they want, but is also able to make a connection with people that brings out the best in them. That is the kind of photographer I want to be; the one who makes you feel really resplendent. Another definition is “to decorate with brilliant colors”. I promise I will not wear black all the time! *gulp* I’ve gradually added more color to my wardrobe and hope to continue. 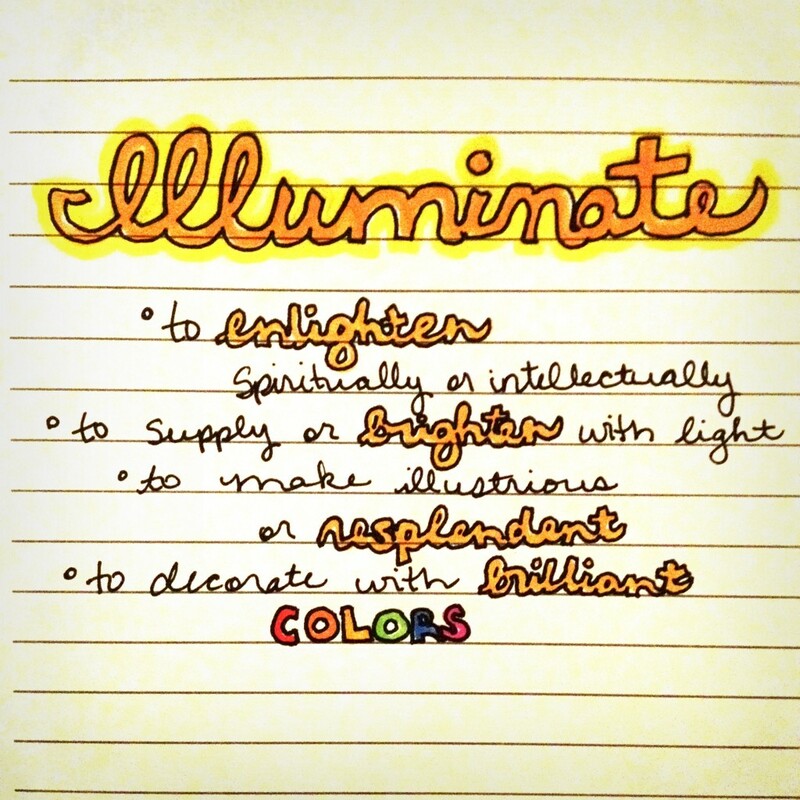 So instead of resolutions, I am embracing my word of the year: ILLUMINATION. What about you? Do you have a word of the year? Karen is offering a new course starting next Monday called Create.2013, if you are interested in exploring different types of creative outlets including journalling and photography. This post is in no way sponsored. As a matter of fact, Karen doesn’t even know that I’m writing it. I really enjoyed PathFinders and know that some of you would love this type of opportunity.